Oscar Parkes OBE MB Ch B (1885-1958). Watercolour heightened with white and signed (lower left). A fine example of this competent artist's work, this is an attractive watercolour with a superbly well executed sea. 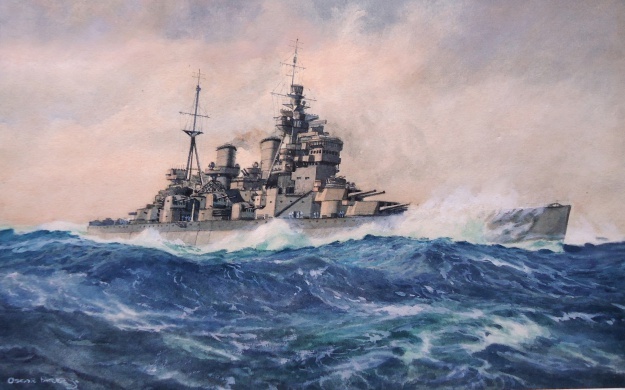 Officially completed in the late autumn of 1940 KGV was subject to many additions and alterations during this period to ensure that she was equipped with cutting edge radar, radio and above all, air defence equipment. By April 1941 she had become C-in-C Home Fleet's flagship and as there is no sign of his flag here (the battleship's white ensign is hidden behind the upperworks and lower reaches of the foremast?) this painting is possibly of that period, between first commisioning and April 1941. The heavy degaussing cables do not yet appear to have been fitted around the upper hull yet the aircraft and its catapult gear are clearly still in place (see the catapult's starboard "over run" sponson just visible still in place forrard of S3, the leading 5.25 inch turret of the after group and between the two funnels). Radar and DF aerials are beginning to sprout as well and this is all evidence that the ship was in the early stages of her first commission, a commision that would shortly see her leading the chase for the German battleship BISMARCK. Oscar Parkes OBE MB ChB was a doctor in general practice, qualifying in 1914. He joined the Royal Navy and after some sea time was appointed to the Naval Intelligence Division at the Admiralty. In 1919 he became official naval artist and director of the naval photographic section at the Imperial War Museum and although he left the Service in 1920 he had already been appointed editor of Jane's Fighting Ships, the annual publication founded in 1897: he was to occupy this post with distinct success for some 17 years. He also produced the authoritative work on the Royal Navy's battleships - British Battleships: a History of Design, Construction and Armament which, following its conception in 1925 was finally published to great acclaim in 1957: it remains to this day the final word on the subject and can never be superceded. As well as all this he was still painting and his works are much admired and collected these days though there are far too few of them! He features in the collections of both the National Maritime Museum Grenwich and the Imperial War Museum. All the while he remained involved in medical practice and was for a while on the staff of Fordingbridge hospital in Hampshire. In 1958 he retired and went to live in Northern Ireland where he died aged 72 that same year. Painting, his garden and the Royal Navy were his abiding passions.